Misha’s bridal ensembles that ranged from vibrant to muted revealed many sides of her charismatic personality. It was all about colors and interesting accents at Misha's wedding celebrations at the Taj Jai Mahal Palace hotel in Jaipur, Rajasthan. 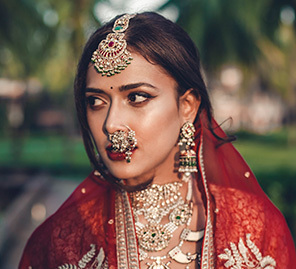 From blooms in vases and ensembles, to standout jewellery carefully picked to complete every look, this wedding was all about quirky yet classy charm. 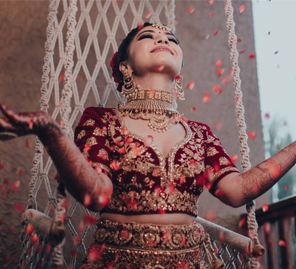 With pretty flowers in every shape and size as the decor highlight of this function, the mehndi ceremony was resplendent with gorgeous elements. Misha looked beautiful in her dazzling lehenga which featured red and pink floral embroidery all over. With purple and blue being the color highlights of the decor, the unconventional ideas and creativity this bride exhibited was impressive. For the haldi ceremony, Misha wore a yellow ensemble with a beautiful border and simple embroidery. One can never go wrong with marigold blooms at a wedding function and the beautiful floral arrangements at the venue made for a fresh, vibrant backdrop. Misha kept her look very natural which suited the event. For the sangeet, Misha wore a glamorous gold lehenga by Sabyasachi to tap into the contemporary vibe for this event. She matched her jewellery with the lehenga and wore a gorgeous necklace with bangles and earrings. She kept her makeup to the bare minimum and went in for a bit of glamor with a wavy hairstyle. 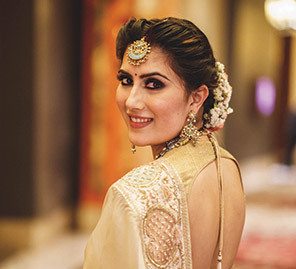 Misha kept things elegant for her wedding look by picking a bright orange lehenga by Anita Dongre and pairing it with beautiful jewellery that had a hint of green, which added a pop of color to her look. Her ‘maang tikka’ (forehead ornament) and ‘nath’ (nose ornament) added to her a regal vibe. Her makeup was all about highlighting the eyes alongside a subtle, soft look that made Misha’s face glow all through the function. The beautiful color palette of pastels created an ethereal and romantic feel at Misha’s reception. An assortment of lanterns and tea lights filled the venue and the whimsical floral patterns packed a punch. The bride wore a light teal lehenga with intricate embroidery and gorgeous jewellery for this event.